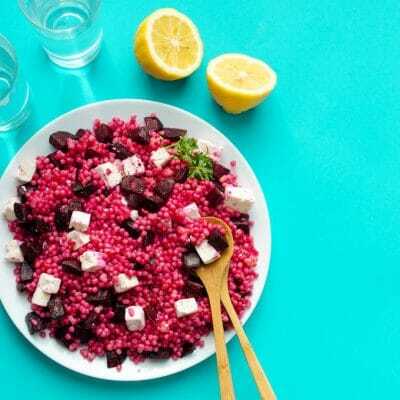 With gorgeous magenta beet and cubes of feta, this Israeli Couscous Salad is the side dish so beautiful, it may as well just be the main course! We all need a back pocket kind of side dish that we can whip up when dinner becomes an afterthought. And when that side dish looks (and tastes!) 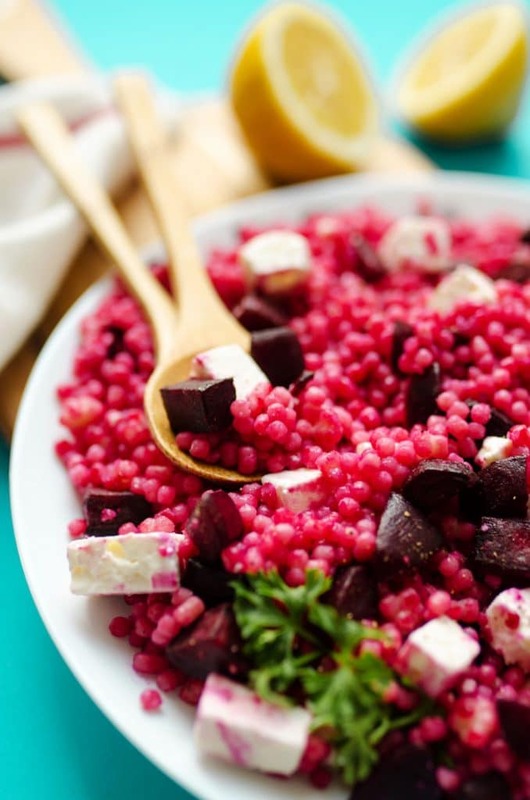 as fun and festive as this Israeli Couscous Salad, no one will guess how easy it was to make. Just roast some beets, stir them together with Israeli (a.k.a. Pearl) Couscous, and toss with lemon juice and feta cheese! We’re making this couscous salad with a particularly fun variety of couscous. It’s called “pearl” or “Israeli” couscous, defined by its larger size and slightly chewy texture. It’s made from semolina or wheat flour, making for a slightly neutral taste (a bit like pasta) until you flavor it up with sauce or other ingredients. And when you mix it with roasted beets, it becomes a vibrant pink color that instantly brightens up the dinner table! 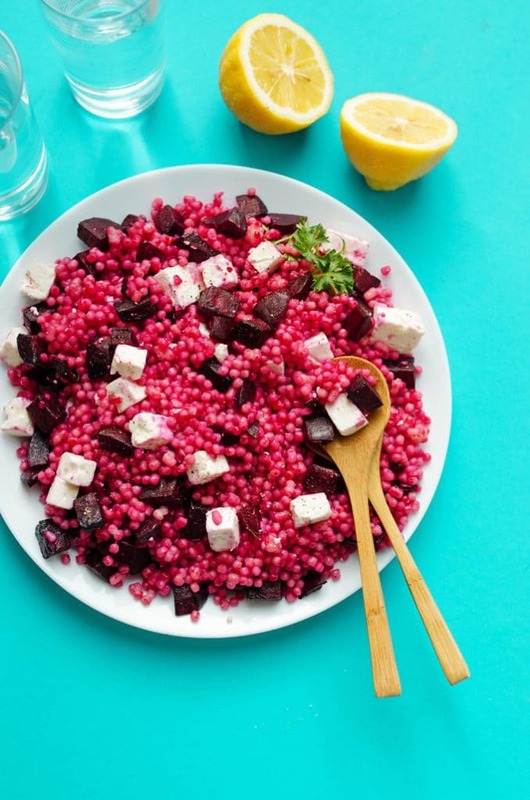 We’ll throw in a touch of lemon juice and feta cheese to offset the distinct beet flavor, sprinkle with salt and pepper, and serve! Israeli Couscous: Otherwise known as Pearl Couscous. You can substitute it with quinoa, bulgur, or wild rice! 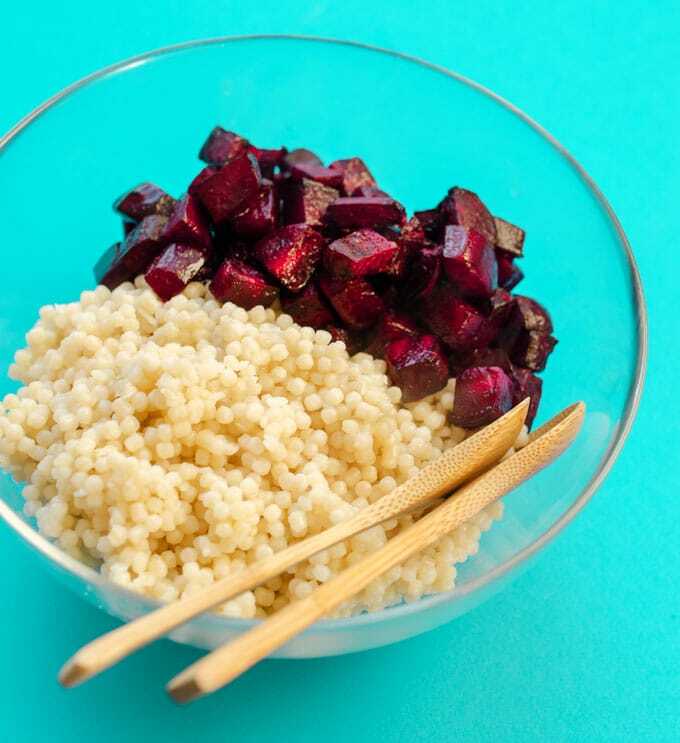 Red Beets: Roasted to bring out the natural sweetness and release some juices, important for that bright pink couscous. Lemon Juice: The acid in the lemon juice reacts with the beets to make the color even more vibrant. Because this recipe has such few ingredients, try to use fresh lemons for the best taste possible. Feta Cheese: My favorite pairing with beets. You could substitute soft goat cheese (or even ricotta, if you prefer a milder cheese). Roast Beets: Preheat oven to 400 degrees F (204 C). 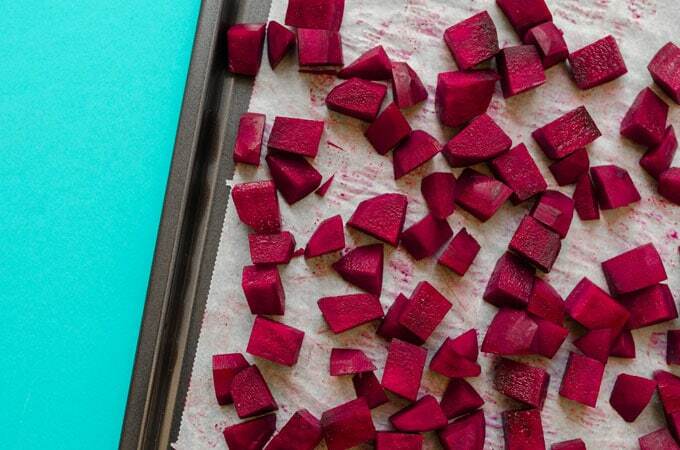 Peel and dice beets, then spread onto a parchment-lined rimmed baking sheet. Drizzle with oil, tossing to evenly coat, then roast for 30 minutes, or until fork-tender. Cook Couscous: Meanwhile, bring water to a boil in a medium pot and add couscous. Cover and cook for about 10 minutes, or until couscous is “al dente” and water is absorbed. This post contains affiliate links, which means if you make a purchase after clicking a link, I may earn a commission (at no extra cost to you). I first published this recipe over on Amanda’s Cookin’, where I’m a contributor. Thanks so much for dropping by and for making easy vegetarian recipes like this Israeli Couscous Salad possible!